Discuss Salford Red Devils v Leeds Rhinos here. Salford by 6, Leeds still need time to gel. Really tough to call. Not been impressed by Leeds one bit, whereas Salford have had 2 good results but I haven't actually seen them play yet. If this was being played in a months time I would back Leeds. By then Leeds new signings should be more up to speed and Salford's skinny squad might be starting to get tested by injury. But for now I think you have to go with form. I look at who each side has played coming into this and can't help think that Leeds' two losses against arguably the best two side in SL will be a lot more valuable in this game that Salford's wins against Broncos and Hudds. Leeds to take a confidence boosting win - by 12. We very rarely get anything from Leeds and I am not sure that this week will be any different. However, more in hope than expectation, I'll say Salford by less than 10 points. It’s an interesting matchup after the first two rounds. I reckon a healthy Salford can ride a slightly out of sorts Leeds pretty close. If Lui and Hastings turn it on it could be a long 80 mins for Leeds, I am with 'The Legend' when he says that the half back pairing of Myler and Lolohea are probably the worst 6 and 7 combo Leeds have had for a very long time. Based on two games against last years grand finalists? Anyway Myler and Moon weren’t very good so even if what you say turns out to be true its not the worst for a very long time! Travelling and home fans should be aware that a large part of the car park (closest to the bridge) currently has a large theme park! Half full - the attraction does not open until 17:00 on game day ( opens earlier all other days, so special arrangements appear to have been made for the game) and has some great offers available if you want to make it a special day after the game. Just be aware and plan accordingly - I drove past earlier and it looks pretty awesome! Just had an email from Salford. 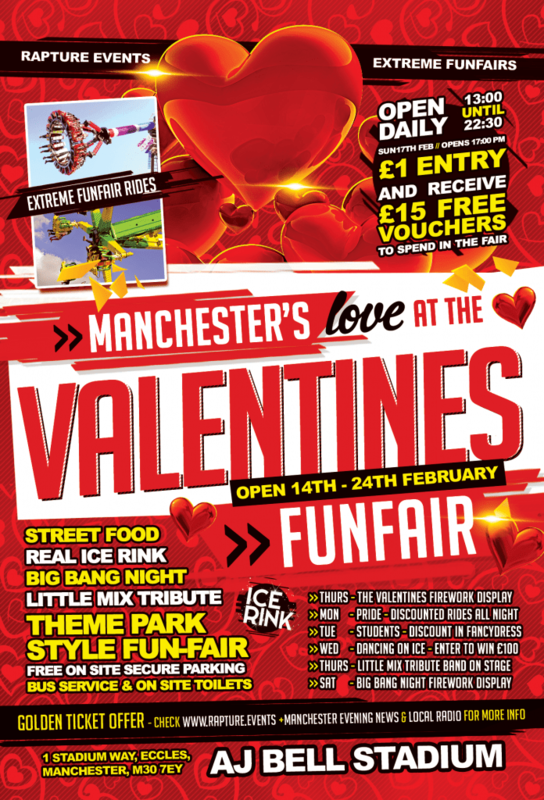 The funfair is open from 12.30 before the game with free admission for ticket holders. The club have also got a ten piece band performing outside the stadium before the game. Salford were earlier in the week, Leeds must be heavily backed as Leeds are now favourites. A Leeds win will see the bookies lose a few quid on this one, a rare occasion that will make victory even sweeter. This is the kind of thing all clubs and the governing bodies should be looking to do, some event around the actual game. I know a lot clubs' budgets might not stretch far and it might no always be feasible, but something to make the day feel like an event rather than a chore, i know a lot of people ridiculed Keighley and then Bradford, but it was something that worked, Batley do something similar, with local farm shops barbecues and local breweries providing a variety of beers and sometimes a band on, and a bouncy castle for the kids etc. The game has gone a bit stale, on and off the pitch for many, what with the 2 hour games and the fan unfriendly structures lately, we should be looking at ways to get people back, as well as attract new fans, offering cheap tickets to sit in a squashed seat at Anfield isn't the answer either. Leeds took a massive step forward last week from the first game of the season , but still expect Salford to win , not convinced of Leeds half back pairing . Salford are a very good side, especially their best 17 and will run better teams than Leeds close this season. If they keep fit they are dark horses imo. Leeds have a very average pack and poor half backs. If teams play the men in front of them rather than the name of the "club" then they are a lower half team, Salford with a full compliment should win. Salford score a try off their first real attack after some poor Leeds defence. Well that all happened very quickly didn't it. 3 tries in 6 minutes. Now 14-20, Reds down to 12 with a sin binning.